Home › Film and TV › Spendalot – Ireland’s generous tax breaks for film investment have failed to deliver the holy grail of a sustainable indigenous movie industry. Spendalot – Ireland’s generous tax breaks for film investment have failed to deliver the holy grail of a sustainable indigenous movie industry. The following article appeared in The Sunday Times on June 20th 2010 written by Brian Carey. I was one of those who contributed to this article. For a very long time most within the industry have refused to acknowledge that all in the Irish film industry has not been performing and requires a good shake up. Years of tax incentives have failed to develop a stable sustainable industry, and it lacks leadership and direction. And who’s role is it to ensure we get the best return for investment? Should it be the film board, producers or….? At the moment the industry has almost come to a standstill without focus or vision. I would very much welcome any comments you may have on our industry. Ireland’s generous tax breaks for film investment have failed to deliver the holy grail of a sustainable indigenous movie industry. Should they be cut? It is easy to get your first big break in the Irish film business: you simply call an accountant. Horwath Bastow Charleton (HBC) last week started its marketing of tax breaks for Camelot, a new American television mini-series which starts filming here this month. Produced by the veteran Morgan O’Sullivan, Camelot promises to be a blockbuster, especially for HBC clients. More than €6m in tax breaks will be doled out to middle- and high-income earners. As the series has already been sold to Starz, a US cable television network, the Camelot investment will have a guaranteed return. Despite the credit crunch, there is 100% bank finance available to investors. In short, it offers no risk, a decent return, and best of all, involves investing other people’s money. 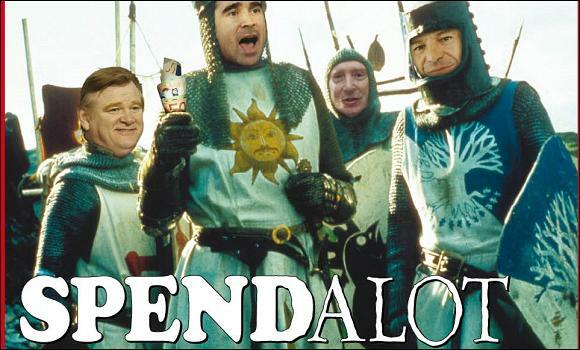 Tax incentives on projects such as Camelot are the only surefire hits in the Irish film industry. More than €300m has been invested in films by Irish investors in the past three years, creating a tax loss for the exchequer of €100m. In the first four months of this year, section 481 [film tax ]relief investments had raised €34m from punters. This was achieved in the depths of a recession, and when tax revenue is scarce. Big productions such as Camelot clearly bring millions into the Irish economy. But how effective is the incentive in developing the indigenous film industry? On this, the jury is still out. Only two Irish Film Board-backed movies, Once and The Wind That Shakes the Barley, grossed more than $1m (€809,000) each on release in America in the past three years. Irish films have not done much better at home. The distributors of Zonad, a recently-released low-budget comedy, received a €75,000 grant from the Irish Film Board to market the movie to Irish audiences. It spent two weeks in the Irish Top 20 in April, during which it took €33,848 at the box office. It hopes to earn more abroad. There are other tensions within the trade. Big-budget productions are helping to drive up costs and impose antiquated work practices on the sets of smaller, low-budget Irish productions. In an industry where unskilled hands can earn more than €1,000 a week before allowances, up to 50% of some workers on Irish film sets are handpicked by trade union officials. Called “nomination”, it is a practice unknown in other countries. Ralph Christians, a German film-maker based in Galway, revealed at the Cannes film festival how he was forced to bring a “nominated” carpenter from Dublin to construct sets for a film his company Magma Films was making in Galway. Is this the legacy of 17 years of support for the Irish film industry? The plot is not quite so simple. Making a link between the tax lost by the exchequer on Section 481 and the performance of low-budget Irish feature films at the box office is unfair. Most money raised under the section 481 tax scheme subsidises the production of television drama, domestic and international, and visiting Hollywood productions. Local features are definitely near the end of the queue, even those from top directors such as Neil Jordan or starring actors such as Colin Farrell and Brendan Gleeson. Filipa Limited is one of the biggest names in the Irish film business. It is a trust company run out of the law firm Matheson Ormsby Prentice. MOP’s film unit is headed by James Hickey, Ireland’s best known film lawyer, and a former chairman of the Abbey theatre in Dublin. In 2007 and 2008, Filipa handled roughly 80% of all section 481 investments, amounting to about €80m. Its accounts give a good insight into where Irish tax money is spent and who benefits. The Tudors, a costume drama made for Showtime, dominates. It raised €19m and €16m in 2007 and 2008 respectively, and was by far the biggest beneficiary of the tax break. The next biggest fund-raiser in 2008 was the BBC’s Inspector George Gently, which received €7.8m, its third year of accessing section 481 money. The Take, a drama for Sky TV, raised €4.8m. In 2008, significant sums were also raised for local TV programmes. Ros na Run, the Irish language soap opera, raised €3.5m, The Clinic received €5.4m, Killinaskully €2.1m and Raw €3m. In all four cases, the tax breaks on these investments, totalling around €4m-€5m, were given to productions that were bought by the state-funded broadcasters RTE and TG4. Both the purchaser and the seller were being funded by the taxpayer. The national broadcaster is a massive beneficiary of section 481, but its support for the film industry here is negligible. “RTE’s drama department remains resolutely determined to show only films that are crafted for television, mostly sourced from UK companies,” said Simon Perry, the chief executive of the Irish Film Board. Unlike most other European countries, RTE plays no role in developing indigenous film, which is “a great opportunity missed”, according to Perry, particularly as it would cost “very little money”. Christians, whose Magma Films made the animation feature film Niko & the Way to the Stars, is more strident. He told a trade magazine last year that the national broadcaster is “a total zero factor”. Christians raised €900,000 from Finnish TV for Niko, which was sold to 120 countries. He said RTE could not even sell its output “to the Faroese”. But indigenous film-makers support the role played by the big-budget productions, saying they provide employment opportunities and spin-offs for the local film sector. Garret Daly, a film-maker and lecturer on film at the Institute of Technology in Tallaght, says that the bigger productions are “a massive benefit”. Daly, who makes low-budget short films through his production company Mixed Bag Media, says the film industry here might seem to attract a lot of funding, but it is all relative. “Film-making is an expensive business,” he said, adding that Ireland came to the business relatively late, when Section 481 was introduced in 1993. The total Irish Film Board budget is less than what was spent in Ireland by one season of the Tudors, says Daly. “But [at least] we have an industry,” he added. But how competitive an industry is is another matter. Electricians can earn €4,000 a week on set here, but work is sporadic and the hours are long. Privately, Irish producers complain more about perks and restrictive practices. Tom Dowling, a seasoned construction manager on Irish films such as Circle of Friends and Reign of Fire, says he has been physically threatened on sets for refusing to comply with union rules. Perry agrees that there are wage expectations and work practices in Ireland that “have not been contemplated or heard of in other European countries in decades”. He accepts that the wage expectations are set by the international big-budget productions that are attracted here by tax breaks. As long as these productions are seen as the norm, a “workable industry” agreement will never be achieved and “the making of Irish films by Irish film-makers will be creatively weakened and materially endangered”, he said. Perry stresses the “serious damage” is done by a minority of craft workers, but the victims are the indigenous film-makers. “The producers of tightly-budgeted Irish films simply have no way of combating the unofficial picketing, intimidation and disruption that regularly shuts down the first days of shooting,” said Perry. Jordan will go to Hungary next year to direct The Borgias, a mini-series for Showtime, working with Michael Hirst, who produced the Tudors with O’Sullivan in Ireland. Hungary and the Czech republic have a strong tradition in film-making and far lower pay rates for the crew and are now set to develop their own tax incentives. Ed Guiney, whose company Element Productions made Zonad, says it is a measure of section 481’s success that it is being replicated elsewhere. THE An Bord Snip Nua report, an examination of public sector spending, said there was “no objective economic case to support the film industry” and it was “not affordable” in these straitened times. The review suggested that film development should be incorporated into Enterprise Ireland. The recommendation got short shrift from the government, which made the terms of section 481 more attractive for investors in the last budget and only marginally trimmed the funding for the Irish Film Board. But the tax break will be reviewed in 2012, the third such examination by the Department of Finance in the break’s 17-year history. If the film industry wants to keep the break, says Dowling, it needs to start mustering its resources in a more concerted fashion. Only then will the holy grail of a sustainable film industry be achievable. But the tax break will be reviewed in 2012, the third such examination by the Department of Finance in the break’s 17-year history. If the film industry wants to keep the break, says Dowling, it needs to start mustering its resources in a more concerted fashion. Only then will the holy grail of a sustainable film industry be achievable.